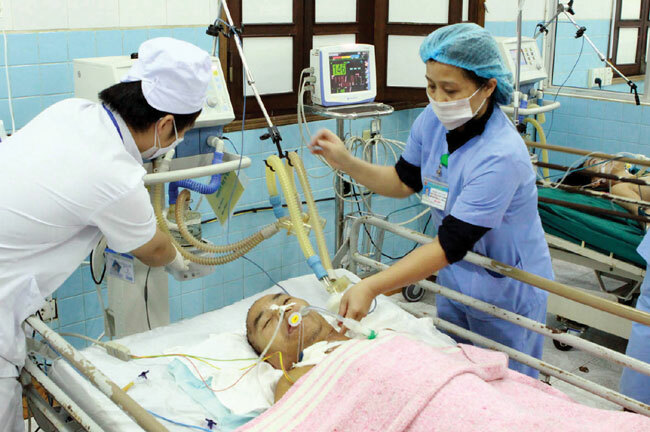 HA NOI (VNS) — Hospitals are making progress in efforts to cut down on overcrowding, Health Minister Nguyen Thi Kim Tien said on Sunday. Participating in the TV programme People Ask, Ministers Answer, she conceded that overloading remained a problem despite hospitals committing themselves to solving it. The Health Ministry started a project to reduce overcrowding three years ago. Twenty-three out of 38 central-level health care facilities across the country and another 18 hospitals in HCM City had committed to not forcing patients to share beds. Minister Tien said the hospitals made the promise based on their abilities, and agreements between leadership and staff. "Some have shown their commitment by building additions onto the hospitals or opening more branches to add more beds," she said. Hospitals in HCM City have built satellite hospitals in other provinces. Doctors and staff at about 45 provincial hospitals have been trained and technology has been transferred over. Tien added that she expected more major hospitals like Bach Mai Hospital in Ha Noi and Cho Ray Hospital to join in the commitment. Bach Mai Hospital could ease overcrowding with its nearly complete 19-storey addition. Cho Ray Hospital recently opened its new Tumor Treatment Centre. Technical transfers from major central-run hospitals to those at lower levels was fundamental to solving patient overload, Tien said. About 30 to 60 per cent of people who went to central-run hospitals for treatment could be treated at lower-level hospital with the same expertise and better conditions, she noted. Tien also discussed Viet Nam's health insurance during the programme. The country offered packages with a lot of benefits, she said. Viet Nam's revised Health Insurance Law requires all family members to join the insurance scheme. Tien said people got more benefits when their families joined. The first member in a family pays VND621,000 ($28.7) per year. The second pays 80 per cent of the sum, the third 70 per cent and the fifth 40 per cent. Tien said more effective communication could help people understand health insurance and its benefits. She called for more efforts in communication and more support for near-poor households. Health insurance covers 59.3 million people in Viet Nam, or 67 per cent of the country's population, according to Government statistics. The country aims to expand health insurance to 70 per cent of the population by 2015 and more than 80 per cent by 2020.